Price is for arch only, columns sold separately. This is a great looking backdrop that will easily fit two people under it. Overall size: 97"W x 18"D x 103"H. Shipped in multiple boxes. Available in Gold Leaf, Frosted Silver, White or Onyx Bronze (textured black/brown) finishes (choose finish upon checkout). 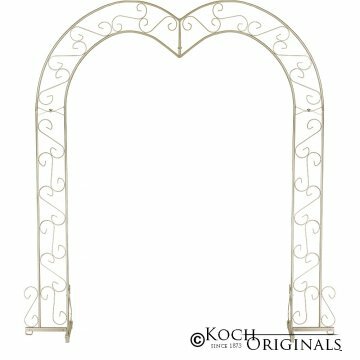 To receive arch with columns, also order item# CO-38. Florals and candles in pictures are not included (available for separate purchase).